Cash Out allows you to take an early payout on your bets before they are settled, meaning you are able to get money back before the event is over and your bet is ultimately resulted. You’ll either make a profit, or get a portion of your initial bet back, depending on how your selection is doing at the time of your taking up the Cash Out. The amount you will be offered will reflect in your My Bets tab and will be based on the actual odds at the time you chose to look for a Cash Out offer. The amount on offer will never be more than the total potential win of the betslip. Team 1 scores to lead 1:0 – this increases the chance of you winning your bet, so we may offer you a Cash Out of 14. You can either choose to take the 14 (your bet, plus a profit of 4) or wait until the end of the game and hope that Team 1 goes on to win and you win the full 18. Team 2 scores first to go 0:1 up – your bet is less likely to win. 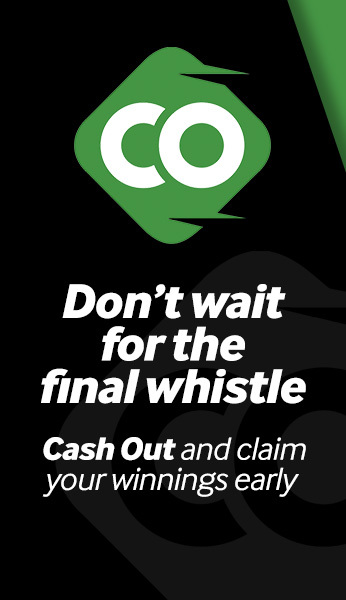 We may offer you a Cash out offer of 6, meaning you can either accept the Cash Out offer and get 6 back, or stand the chance of losing your entire 10 if Team 2 go on to win the game. You win the first 3 games but are unsure of your selections in the remaining 2 – depending on the odds at the time, we may offer you a Cash Out offer of 22. Your options are to either cash out before the last 2 games start, having won an extra 12 off your initial bet, or hope the other 2 events win and claim the full 35. You could also wait for the remaining games to begin and check to see if a Cash Out offer is available mid-game, depending on what is happening in the game. If you decide it was not a good bet for some reason, you may be offered an early Cash Out before the game has begun. This offer will allow you at least to get something back on a bet you think might lose. Please note: in all of these scenarios, once you choose to accept a Cash Out, your initial bet is considered settled and closed and will no longer appear in your Open Bets. At this point you won’t have the chance to win anything else off that bet. Betway does not guarantee to offer a Cash out offer at any time or on any game.